New review about bipolar disorder! Despite the rising need for adequate animal models of bipolar disorder, there are just a few models covering both episodes, mania and depression, as well as the switch between. 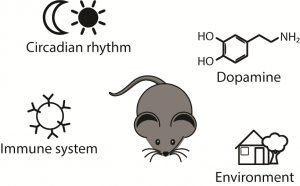 In their newest review Animal models for bipolar disorder: from bedside to the cage published in the International Journal of Bipolar Disorders Dominik and Nadja recapitulate the state of the art models. Specifically, they focuse on the immune system, circadian rhythm, environmental stressors and neurotransmitters. As a new aspect they compare findings from bipolar patients with existing bipolar animal models. Congrats Dominik & Nadja to your new review!